Wondering which format are supported for playback on your Samsung Galaxy S8? Check this guide to see Galaxy S8 specs, including its best playback video audio format and native codec. There is no denying the fact that the Galaxy series from Samsung is the most popular Android lineup to date. With its latest iteration of the Galaxy S8 and Galaxy S8 Plus, Samsung sold over 30 million units before the phone even launched. The Samsung Galaxy S8 is without a doubt the most beautiful, polished phone I've ever held. It's a very high-resolution, 2,960x1,440-pixel display, and that makes text, images and video absolutely pop, even in direct sunlight, which makes enjoy HD movies on Galaxy S8 is fantasitic. But can we play all movies on it? You need to know of what formats can play on Samsung Galaxy S8. Although Samsung claim that Gaalxy S8 supports M4V and MKV playback, you transfer your movies to this smartphone you will be in trouble. You can't play .m4v files on Galaxy S8 at all. You must get the iTunes DRM protection clean and convert iTunes M4V to Galaxy S 8 friendly video formats like H.264 MP4. In addition, how can we play Blu-ray and other downloaded movies on Galaxy S8? 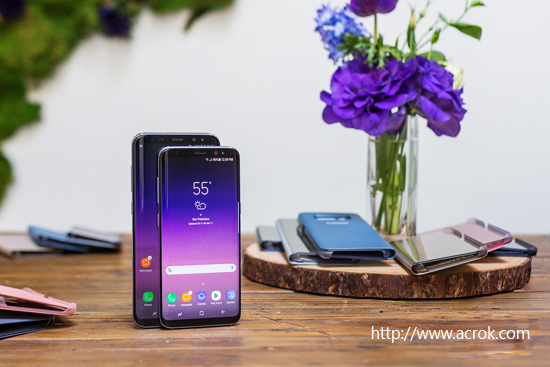 For playing all movis such as Blu-ray, MKV, MOV, AVI, MPG, RMVB, etc, you have to convert these files to Galaxy S8 supported formats via third-party software. Here you need video converter for Galaxy S8. Acrok Video Converter Ultimate is a handy video converter that convert any movies/videos to Galaxy S8 playable format. 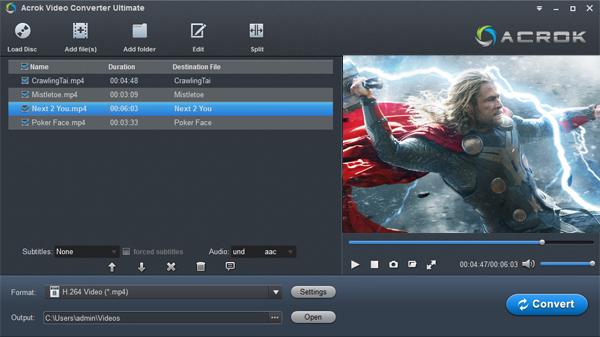 With this smart video tool, you can convert Blu-ray, avi, mkv, wmv, flv, rmvb, mpg, mov, mp4, m2ts, vob and etc. videos to Galaxy S8 playable format. If you are running Mac system, you can get Mac version for this Galaxy S8 video converter - Acrok Video Converter Ultimate for Mac. Tip: For playing iTunes M4V movies on Galaxy S8, Acrok M4VGO is you best choice to do some jobs. It's an all-in-one DRM removal and video converter that can help you legally remove DRM from iTunes purchased M4V video files and convert them to Samsung Galaxy S8 MP4. 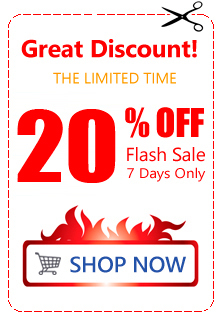 You can get it via 25% Off now. Part One: How to convert Blu-ray for Galaxy S8 via Galaxy S8 Foramt Converter? Run the best Blu-ray Ripper and click Load Disc icon to add Blu-ray movies from your Blu-ray ROOM. All the loaded files will be listed on the left item bar and you can preview them on the right as the picture below shows. According to Samsung official website, H.264 MP4 is the most compatible video format for Galaxy S8 . So, here we recommend you select "Android > Samsung Gaalxy S Series Video(*.mp4)" as the export format. It would fit on Galaxy S8 perfectly. After all these have been prepared, just click the "Convert" button to begin the Blu-ray to Galaxy S8 conversion. Part Two: How to convert MKV/MOV movies to Galaxy S8 supported formats? Run Acrok Video Converter Ultimate s the best Galaxy S8 format converter. Click "Add Files" to import MKV or MOV vides from you computer. Another method to import files is the simple drag-and-drop operation. Batch conversion is supported so you can load multiple files at a time. If you want to join all the imported files, just click "Settings" icon then tick "Merge all videos into one file" on the bottom. Simple click "Format" bar to choose Galaxy S8 supported format. 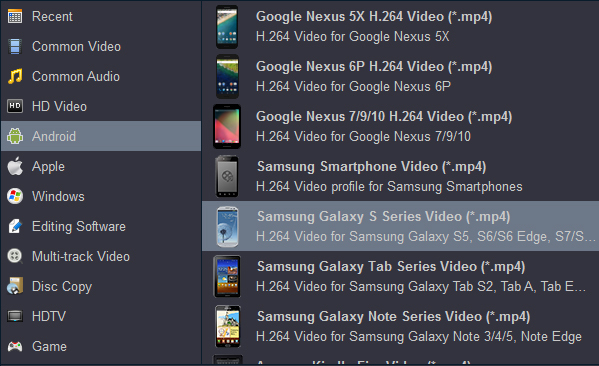 You can go to "Common Video", "HD Video" or "Android" category to get H.264 MP4 profile. Before starting the conversion, you still have the option to edit the video files as you wish. When all settings are done, simply click the Convert button to activate the MKV or MOV conversion. You can get the converted files from the output folder. That's all the steps you need to follow to convert downloaded video files for Galaxy S8. It’s easy as ABC, right? Download to test it now. Fed up with being restricted to play your video files on only specified devices or players due to the DRM copy protection? Now it's time to free your video library. With iTunes to Galaxy S8 Converter, you can legally bypass digital copyright protection from M4V, WMV and ASF video downloaded or purchased from iTunes store. After that, you can play your purchased video on Galaxy S8 anywhere you like without any hassle. If you plan to sync iTunes media to Galaxy S8 for more enjoyment, Acrok M4VGO (Windows Version | Mac Version) can help you remove DRM protection and convert iTunes M4V and M4A format to LG G6 best playback format. By far this is the best blu ray ripping program I have ever used I can do everything myself right from the comfort of my house and its extremely easy to use I love it thank you guys for this video converter.